Gleb Kamenski не оставил контактной информации. DJ, host of radio show "Central branch" and "ASOS, an organiser of leisure activities, founder of the Internet radio project "Night Music Fm"
Immerse yourself in the atmosphere of comfort, leaving behind the bustle of the big city, instantly once in the world where the atmosphere of ease and effortless glamour. 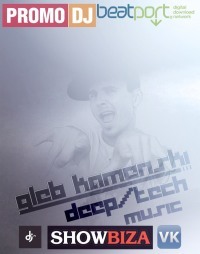 Find yourself in all this sea of bright colors and shades, you can help the work of a DJ Gleb Kamenski.